Jena Rae Masters of Saluda, SC [daughter of Keith Wayne Masters and Sandra Clark Wilson and the granddaughter of George C. & Joanne Clark and Mel & Beverly A. Hoque] and Eddie Paul Butler of Slauda, SC [son of Ernest Butler and Graig Allen & Lisa Marie Stitt and the grandson of Jerry M. & Susan M. Dickey Sr., Eddie M. & Naomi L. Chriswell and Ernest N. & Linda K. Butler Jr.] were united in marriage on Saturday, July 14, 2018 in the Ivory Chapel at Wedding Chapel by the Sea. Rev. Pam Muise officiated. Jena’s attendants were her Maid of Honor Samantha N. Butler of Saluda, SC, her Bridesmaid – Alicia M. Harris of Saluda, SC and her Flower Girl – Morgan Butler. Eddie’s attendants were his Best Man – William N. Corley of Saluda, SC, his Groomsmen – Thomas L. Etters of Saluda, SC and Daniel R. Harris of Saluda, SC and his Ring Bearer – Bryan Butler. After the wedding the wedding party went to the ocean for a Beach Photo Shoot. Eddie & Jena hosted their wedding reception at Pine Lakes Country Club. 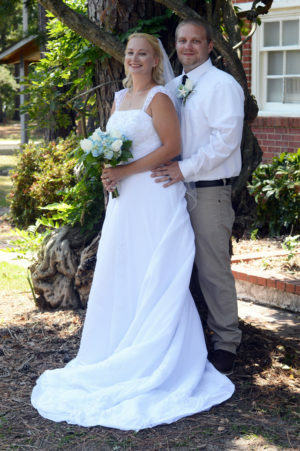 After a honeymoon in Myrtle Beach, SC Eddie and Jena will live in Saluda, SC. We at Wedding Chapel by the Sea are happy we were able to help make you Wedding Day special. We wish you a lifetime of love and happiness together.